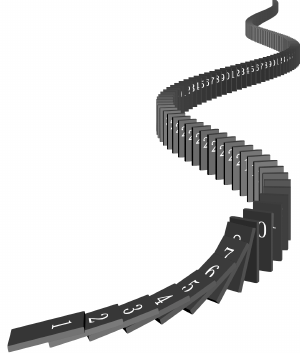 In a line of falling dominoes, each domino has the same experience as the one before it. It is hit, it falls over, and it hits another. In an infinite line of dominoes, only the first one has a unique experience. If we can prove that the first domino will fall, and then prove that any domino will cause the one following it to fall, we can conclude that tipping the first domino will start an endless sequence of falling dominoes. These, in fact, are the three steps of mathematical induction! 3. conclude that it is true for all steps from the first one. As you can see, we count in the same way. We choose a place to start and then keep adding one. With mathematical induction, the steps do not have to be one unit apart. 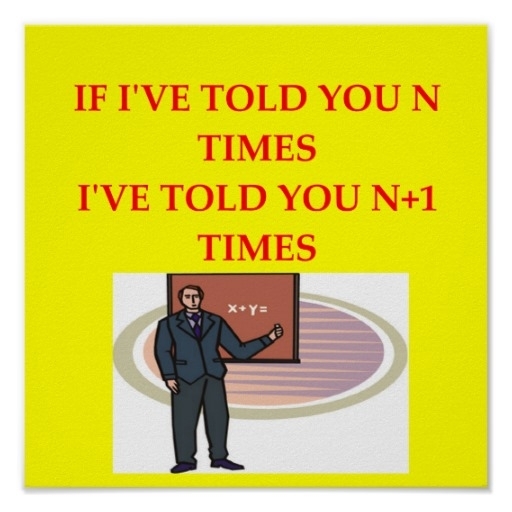 It is important to understand that mathematical induction is not the same as inductive reasoning. Inductive reasoning is not a proof of anything. It is simply drawing/inferring conclusions from a collection of data. Mathematical Induction, however, is a deductive proof (despite its name). It is also closely related to recursion, which is the basis for fractals. Mathematical induction, in some form, is the foundation of all correctness proofs for computer programs. Please note that I could not find any copyright message associated with the above image, but would like to thank Mark Wibrow for using TikZ Code to create it. It was very appropriate for this topic.